Ultrahigh-energy cosmic rays (UHECRs) are known to come from outside of our Galaxy, but their origin still remains unknown. The Telescope Array (TA) experiment recently identified a hotspot, that is, a high concentration of anisotropic arrival directions of UHECRs with energies above 5.7 × 1019 eV. We report here the presence of filaments of galaxies, connected to the Virgo Cluster, in the sky around the hotspot and a statistically significant correlation between hotspot events and the filaments. … snip … On the basis of this finding, we suggest a model for the origin of TA hotspot UHECRs; they are produced at sources in the Virgo Cluster, and escape to and propagate along filaments, before they are scattered toward us. This picture requires the filament magnetic fields of strength ≳ 20 nG, which need to be confirmed in future observations. Hammer projection of nearby galaxies within 50 Mpc (gray dots) and TA UHECR events above 5.7 × 1019 eV (large black dots) in equatorial coordinates. The concentration of galaxies, represented by dark gray dots, is the Virgo Cluster. The red square marks the center of the TA hotspot. The pink and sky blue lines indicate the Galactic and Supergalactic planes, respectively. The purple line indicates the field of view limit of the TA experiment. It has been known that there are structures made of galaxies, which are linked to the Virgo Cluster. For instance, a number of elongated structures, called clouds or spurs, were reported in an early study to reveal the Local Supercluster (13). More recently, using a dataset taken from HyperLEDA, which, in particular, includes a large number of low-luminosity, dwarf galaxies, seven filaments of galaxies and one sheet were either reaffirmed or newly identified around the Virgo Cluster. From a Hubble diagram analysis in the Virgo-centric reference frame, it was found that “six” filaments have galaxies infalling toward the Virgo Cluster, so they are dynamically connected to the cluster … snip … . Figure 2 shows the six filaments, labeled as F1 to F6. Among the six, “three” filaments, F1 to F3, are located within ~20° from the hotspot center, and a number of the TA events are found to be aligned along them. Six filaments of galaxies connected to the Virgo Cluster, F1 to F6. The color dots show the galaxies that belong to the filaments, and the color lines draw the spines of the filaments. The color codes the distance from us to the galaxies and the spines (h is the Hubble parameter). The TA events above 5.7 × 1019 eV (large black dots), nearby galaxies within 50 Mpc (gray dots), the Virgo Cluster galaxies (dark gray dots), and the center of the TA hotspot (red square) are also shown. The correlation between the TA hotspot events and filaments F1 to F3, if it is real, should provide us a clue for the origin of the UHECR events. The straightforward interpretation would be that UHECRs are produced at sources located in the filaments. However, by considering that the members of the filaments are mostly normal, not active, galaxies and many of them are dwarf galaxies (14), and also the total number of those galaxies is small, that would be a less likely scenario. The correlation can also arise if UHECRs are produced inside the Virgo Cluster and escape preferentially to the filaments, before some of them are scattered toward us, as schematically shown in Fig. 4. Galaxy clusters host a number of potential accelerators of UHECRs, listed in the so-called Hillas diagram (3). As noted above, there is a powerful radio galaxy, M87, in the Virgo Cluster, and it has long been argued that radio galaxies could be the sources of UHECRs (16). A large number, ~1500, of cluster galaxies means that there is a good chance of previous episodes of transient objects like gamma-ray bursts, which have also been considered as possible sources (17). It was also suggested that cluster-scale shock waves could accelerate UHECRs (18). In addition, the Virgo Cluster is known to be young and dynamically active with substructures (10), suggesting a high possibility of energetic phenomena. However, the detailed processes of UHECR production need to be further investigated. Schematic drawing of a model for the origin of TA hotspot events. UHECRs are postulated to be produced at a source or sources inside the Virgo Cluster. After they are confined by cluster magnetic fields and roam around for a while, UHECRs escape to the filaments connected to the cluster. Then, they propagate along the filaments. Some of them are eventually scattered by the random component of magnetic fields and may come to our Galaxy. Here, the Virgo Cluster, represented by a gray circle, and filaments F1 to F6 are plotted in the Supergalactic coordinates. Our Galaxy is located at the coordinate origin. The medium between galaxies in clusters, the intracluster medium (ICM), is known to be magnetized at the level of the order of μG strength (19). In the Virgo Cluster, for instance, the Faraday rotation measure (RM) of a few hundreds of rad m−2 was observed in the M87 jet (20). While most of the RM is likely to be associated with the sheath of the jet, it also implies the presence of ICM magnetic fields. In addition, constrained simulations, which were designed to reproduce the density and magnetic field distributions in the local universe, supported the magnetic fields of μG in the Virgo cluster (21). Such magnetic fields strongly influence the trajectory of UHECRs. … snip … Hence, UHECRs, if produced inside the Virgo Cluster, should be rather tightly confined by the cluster magnetic fields. It is believed that magnetic fields also exist in the medium of galaxy filaments, although their nature is less well known than that of ICM fields. In a dataset of NVSS (the NRAO VLA Sky Survey) RMs of extragalactic radio sources, the contribution due to the magnetic fields in the cosmic web was estimated to be σRM ~ 6 rad m−2 (22). It was shown that the dispersion of RM can be reproduced, if filaments are magnetized at the level of ~10 nG (23). More recently, a search for the synchrotron emission from the cosmic web set an upper limit of ~30 nG in filaments (24, 25). Such fields were also predicted in theories and simulations; for instance, the fields could develop through turbulence dynamo during the formation of the large-scale structure (LSS) of the universe (26). In addition, in the hierarchical formation of the LSS, matter falls to clusters along filaments, dragging filament magnetic fields into clusters. Therefore, field lines are expected to be connected to those of clusters. If such a picture is applied to the Virgo Cluster and the neighboring filaments, then UHECRs, which were produced and have roamed around for a while in the cluster, would preferentially escape to the filaments through connected field lines. Along filaments, whose radius is of the order of Mpc, UHECRs can be confined and guided by the magnetic fields of strength ≳ 20 nG, if they are protons. In addition to the regular component, the filament magnetic fields should have the random (or turbulent) component, which can scatter UHECRs. … snip … Therefore, UHECRs, again if they are protons, could be scattered out of filaments, after they propagate a few tens of Mpc. These estimates are consistent with the picture presented in Fig. 4, provided that the filament magnetic fields have the strength of ≳ 20 nG and lc of a sizable fraction of the filament radius. We need to comment on the implication of the Galactic magnetic field. Outside the Galactic disc, it has the strength of ~μG and the coherence scale of ~kpc (35). The magnetic field can deflect the trajectory of UHE protons above 5.7 × 1019 eV by a few degrees (36). The deflection should be much larger if they are heavier nuclei. Hence, the correlation presented in this paper, if real, should indicate that UHECRs are mostly protons. In this paper, we have focused mainly on the origin of the TA events around the hotspot. However, there are super-GZK UHECRs observed in other parts of the sky, which were likely produced at sources outside of the Virgo Cluster. Considering that most of them should still come from nearby sources within the GZK horizon as mentioned above, understanding the cosmic web structure, including the distribution of galaxy filaments, in the local universe would be essential to the exploration of the origin of UHECRs. As for the identification of the filaments connected to the Virgo Cluster, however, the task can be completed only when very deep spectroscopic data of low-luminosity, dwarf galaxies are available, so it should be left as a future work. Ok … so the authors immediately rule out the possibility that the UHECRS are produced along the filaments (i.e., rule out a plasma filled electric universe) and invent a gnome (that the cosmic rays are created elsewhere (somehow) and merely transported along the filaments by *frozen in* magnetic fields that are remnants of some earlier era. They don’t ONCE consider the possibility that the filaments have anything to do with electric current. Just look … the words “plasma” and “electric current” aren’t mentioned once in that article. This is the common failing of ALL mainstream astrophysicists. They can’t think outside the gnome filled house of cards that they’ve created. They just accept that these magnetic fields and their field lines *are* … without really questioning how they came to be. And they never even ask themselves how gravity could pull galaxies into the shape of filaments as they “fall” towards the Virgo Cluster (at least without some other gnome like filamentary dark matter). It’s sad to see them so close to understanding … but yet so far away. Mind you, their instructors in college were probably the experts who once assured everyone that there were no filaments out there … that the EU/PC community was wrong about them being ubiquitous. Just as right now they are in denial of this possibility: https://www.thunderbolts.info/tpod/2006/arch06/060523virgo.htm “The Virgo Cluster Circuit”. There was a rather interesting exchange with leftwinger and Skans on another thread concerning the Big Bang versus the alternative. I'm posting portions of it (the exchange with Skans) here to record the arguments in this place. First, this is my response to Skan's response to a post made by leftwinger with whom I'd also been debating. I read this (given your further explanation) that you do not believe the Universe sprang forth from a specific originating event, like an immaculate birth of sorts. In other words, you do not believe in the Big Bang theory. The observable evidence indicates otherwise (except for the "immaculate" piece). The cosmic microwave background radiation ; observations that galaxies appear to be moving away from us at speeds proportional to their distance - "Hubble's Law,"; abundance of hydrogen and helium all point to the Big Bang. No, I think he does believe in those things, Skans. When I tried to argue against them early in this thread, he linked mainstream cosmologists and what they say, and suggested I'm on drugs for thinking otherwise. What I think he believes in is a *cyclic* universe ... one that has repeated contractions and big bangs ... and I guess no beginning (hence no cause). He does not believe in the steady state universe that EU/PC theorists postulate ... even if it too makes no claim that here was a beginning (i.e., cause). Your theory of the universe is called the "steady state" theory. This is a theory based only partly on a science which proposes to explain how the universe around us created matter on a continual basis, which is only modified by changes, like those caused by us, the explosion of a star, or the effects of gravity as it pulls back the matter and energy from those stars and creates new objects. It has largely been disproved by quantum theory, relativity, and Hubble's discovery that the universe is expanding, and subsequent observations that the rate of expansion is actually accelerating, not decelerating or static. I don't agree that the steady state theory has been disproved. What the mainstream has done is push a host of gnomes to prop up their Big Bang theory and even some of their gnomes. They ASSUME (contrary to evidence in our labs) that redshift equates to distance at all distances in the universe. They ASSUME that electric currents aren't ubiquitous throughout the universe (just like they wrongly assumed that filaments were not ubiquitous) and therefore electric currents have very little effect on the universe when in fact the evidence is showing they effect everything we see. They ASSUME instead that magnetic fields can pop into existence without electric currents and be "frozen-in" to plasmas (which utter nonsense). They ASSUME that magnetic field lines are real things and can "reconnect" (again, utter nonsense). They ASSUME there is dark matter (an assumptions that some of them are now ... finally ... after 80 years of looking fruitlessly ... starting to question). That assumption came about because they wouldn't look outside the box to explain the motions of stars in spiral galaxies ... they only looked at gravity. And not only have years of observations proven that the mass estimates they used to support that assumption were totally wrong, but when they first made that assumption there was already a physics being modeled in computers on earth that would explain what was observed ... a physics involving electric current and plasmas, not gravity. They ASSUME the existence of dark energy (whose existence is a consequence of them incorrectly assuming redshift equates to distance). They ASSUME the existence of black holes ... a concept that has been altered substantially over the years as one phenomena after another has argued against them. They've needed gnome after gnome to prop up explanations involving black holes. And I could go on and on. Mainstream cosmology is a HOUSE OF CARDS, Skans, just waiting to fall apart. The cracks are evident everywhere you look. The Standard Model of matter has been validated at every turn. It said there was a Higgs Boson and they found a Higgs Boson. But LCDM ... the extended model that was developed in an attempt to explain dark matter, is a TOTAL FAILURE. Not one aspect of it has been proven to exist .... even though the LHC (Large Hadron Collider) was supposed to do that. Everywhere you turn (as I've shown in my dark matter thread), there are observations that contradict the mainstream's model ... observations that the mainstream is adding more metaphysical gnomes to explain or simply ignoring ... just as the mainstream is ignoring observation in the Climate Change arena. As our space probes have reached the nooks and crannies of our solar system, the model of the solar system has shifted from one dominated by gravity to one dominated by electric currents and magnetic fields. Prediction after prediction by the mainstream about the solar system has been proven wrong ... prediction after prediction by the EU/PC (electric universe/plasma cosmology) community has been proven right. It's only a matter of time now, I think, before the mainstream's house of cards collapses completely. It's not going to be pretty ... not for all those who defended the mainstream. Never mind evidence of an accelerating rate of expansion. I agree with everything you said before this, but I caution you that the evidence for an accelerating rate of expansion is based on a flawed gnome ... that red shift only equates to distance. It's been theorized that many things can cause redshift (I provided links on that) and some of them have been proven in the lab. The most important is that plasma in a medium through which the light is moving can redshift light. This has been proven in the labs here on earth and is doubtless true everywhere in the universe. And now we know that the intergalactic medium is filled with vast amounts of plasma, far more than the mainstream every imagined ... enough to significantly redshift the light from objects at a great distance and as a result make them seem to be farther away than they really are. In which case, the expansion might not be accelerating. Indeed, there might not be an expansion going on at the boundaries. I'm going to first define "Universe" to be our known Universe - the one with the background microwave radiation, etc. I think it is hard to refute that our known Universe commenced with some sort of "bang". The red and blue areas (red is more energetic than average, blue is less) should be evenly distributed throughout the observable universe. But they aren't. First there's a large, extremely cold spot (see the circle). It's even called the "CMB cold spot". . Second above the white curved line there is clearly on average less energetic microwaves than below the curved line. This curve is called the “Axis of Evil.” The Cosmological Principle says that both of these shouldn’t exist. It turns out that the axis seems to be aligned with the very plane in which the planets of our solar system orbit the sun. There is absolutely no reason I can fathom that would explain why a universal phenomenon is linked to our solar system. However, I can image several reasons why something that is related to our solar system is linked to it. In other words, the Cosmic Background Radiation may not be cosmic. Think about it. We are embedded in our solar system. When we see microwaves coming from all parts of the visible universe, they might just be coming from all parts of our solar system, or all parts of our galaxy. The very fact that the Axis of Evil is aligned with our orbit around the sun argues that it is related to our solar system, not the universe as a whole. Of course, if the CMB is not really cosmic, then it has no value as evidence for the Big Bang. Even if the CMB is cosmic, it clearly argues against the cosmological principle. Now I'd say it's hard to refute THAT ^^^^ logic. And here's another point. The Big Bang theory requires that a phenomena called inflation have occurred during the bang itself, to smooth out the CMB. It’s a CRITICAL part of the mainstream's theory and one of the few predictions of inflation was that the universe would be isotropic … the same in all directions … that it smooth out any large scale asymmetries. A paper in 1997 concluded that the “The most decisive observational evidence against inflation would be provided by evidence that the Universe possesses large-scale rotation.” Also, Big Bang predicted there would be no large structures (collections of galaxies, etc) shortly after the Big Bang … because they take time to form. Well, observations have shown strong evidence of asymmetries, large scale rotation and early large structures. All three are completely contrary to Big Bang and the inflation theory. All three are present in that CMB map. 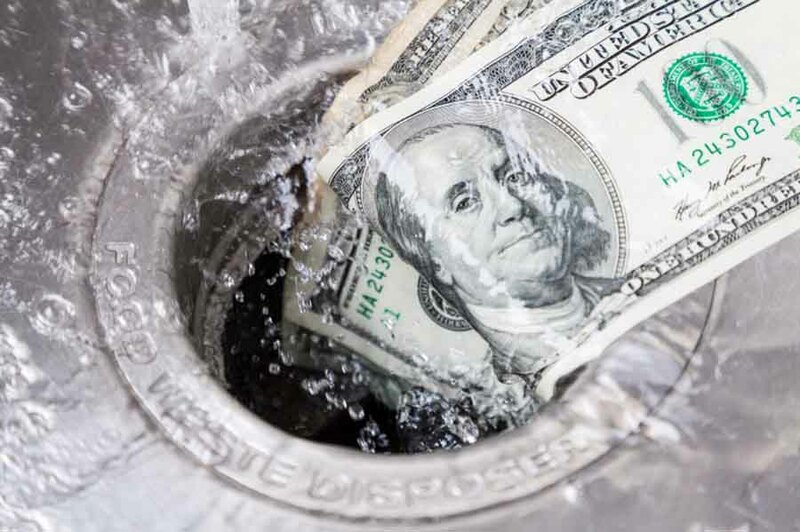 Further, after years and years of looking, scientists still have found NO signs of inflation. They recently had to admit that the one observation they’d claimed proved it (with great fanfare) ... one involving their CMB measurements, was a mistake ... that hat the observation was due to another cause. But have scientists adapted their Big Bang and inflation theory (if it’s even possible) to account for these observations? No, they have simply ignored the observational data and continue to insist with religious fervor that inflation occurred. That that Big Bang occurred. And that the CMB resulted from that. That’s not good science, folks. That’s the behavior of priests promoting a religion. I believe that existence of black holes has substantial evidence, observable evidence, to back this theory; however the exact nature of a black hole is still inconclusive. What is that observational evidence? Certainly they haven't yet imaged one. In fact, we were promised (with great fanfare in 2017) that we'd finally get to see such an image in 2018. Well, where is it? The rest of the evidence is all circumstantial phenomena that they observe and attribute to black holes. The jets coming from galaxies, for instance. But look at the stack of gnomes the mainstream has been forced to invent in order to prop up the black hole explanation for jets. Magnetic reconnection. Frozen in magnetic fields. Magnetic field lines being something real. Claiming that turbulence and shock can produce helically wound plasma filaments. All because the mainstream won't even consider the alternative physics explanation that was offered to them back in 1980s by some of the premiere experts on plasma and electricity ... current carrying Birkeland plasma filaments interacting to for a plasmoid ... something which can not only be modeled in computers but observed here on earth. Maybe they exist but there is no actual proof. Don't be deceived by the hype. Especially since cracks are starting to form in their model ... moving them closer and closer to the model suggested by plasma cosmologists. For example, here's a paper from 2011 (https://www.mdpi.com/2075-4434/5/4/71/htm ) that ended up adding yet another gnome to the black hole model to explain electric current that is observed in the jets. The gnome is called a "cosmic battery". In arguing for this *battery*, they are arguing against the notion that some pre-existing magnetic field and the mainstream’s MHD model can explain the jet (as previously claimed). They say that the accretion disk and the helical magnetic field that’s claimed to be associated with it are NOT the source of the electric current seen in the jet ... that the current must be coming from a “battery” of stored current around the black hole. What form this battery takes they don't know. But there is another alternative … it could also be coming from the overall electrical circuit that EU/PC theorists believe power stars, galaxies, and the lot … with a double layer as both the energy storage device and particle accelerator. just because we have physical limitations which might prohibit us from ever understanding the true nature of the Universe, this does not negate that which we have observed. I never suggested we negate what is observed. Just the opposite. Esoteric mathematical modeling of gnomes should not supersede the supersede what the observations show. Mainstream astrophysicist shouldn't be allowed to ignore what we see in order to keep their *belief* in the gnome alive. Yet that is precisely what they are now doing in case after case. A house of cards indicates that all of our observations and inferences made from those observations are utter nonsense. No. My calling the it a house of cards says nothing about the observations ... only that the inferences and gnomes used to support those inferences are nonsense. The problem is that mainstream astrophysics has made esoteric mathematics king rather than observations. Which turns science upside down and backwards. They've made computer models based on the assumed existance of those gnomes king, rather than making physics that we can see and test right here in our earth base labs king. You can think of it as the mainstream model as returning to epicycles to explain the observations ... that turned out to be a disaster, didn't it? Have we truly identified every subatomic particle and do we understand how each particle acts in concert with other particles? If this is true, Crap!, where have I been? Don't beat yourself up. You've just been in the same place most everyone else has been ... mesmerized by all the fairy tales constructed around all those fascinating gnomes. In which case, the expansion might not be accelerating. Indeed, there might not be an expansion going on at the boundaries. I don't disagree with this at all. I just mentioned that there is evidence of expansion, and evidence that the rate of expansion is accelerating, not that it was settled fact. You point out some other causes which could (possibly) counter that evidence. I don't see that our positions are inconsistent. For one, there are other things that could cause diffuse microwave radiation in every direction, and there were estimates long before Penzias and Wilson as to the *temperature* of that background that were surprisingly close to the actual value. So, I do actually read interesting articles that some people post and I read yours. First, the article you linked to does acknowledge that the CMB is evidence of a Big Bang. But, then it goes on to argue that the Cosmological Principal (ref. your picture above), which is part of what the Big Bang is predicated upon (or at least according to your article) actually is evidence against the Big Bang. Why? Because the Universe appears "lumpy" rather than uniform. My reply to this is that it the author is being overly simplistic in assuming that anyone really knows what the "Big Bang" was. Was it really something from nothing springing forth from a point of singularity the size of a proton? I sure as heck do not believe that! I am also familiar with the theory that artfully tries to describe the Big Bang singularity in terms of quantum physics as some sort of "virtual particle" that has been observed in quantum physics to randomly become a pair of heavier particles (something out of nothing) or that some subatomic particles can randomly appear and disappear (more something out of nothing). I don't believe any of this. First, I don't believe that quantum physicists have a grip on what they are observing - i.e. I don't buy into the something out of nothing theories. Second, I don't think there is any possible way to extrapolate the Big Bang from some odd, unexplained event observed in quantum physics - that's just too big of a leap for me - and I don't care if "the math works". The reason I went through what I said above is because assuming there was a Big Bang, there is nothing presently within quantum physics nor within our observable Universe as it is today which can explain what happened. Why is this important? Because I do not believe the Cosmological Principal applies to what happened in the Big Bang. I think (but cannot prove) that the Big Bang involved something or some things outside of our known Universe; outside of our physical laws and thus outside of this Universe's quantum physics. Sort of like trying to use SAE tools to fix a Japanese motorcycle; we're looking at something that happened in the past through virtual glasses tuned only to this Universe's frequencies. So, where do we go for here? I can't say much more than that. First, the article you linked to does acknowledge that the CMB is evidence of a Big Bang. But, then it goes on to argue that the Cosmological Principal (ref. your picture above), which is part of what the Big Bang is predicated upon (or at least according to your article) actually is evidence against the Big Bang. Why? Because the Universe appears "lumpy" rather than uniform. My reply to this is that it the author is being overly simplistic in assuming that anyone really knows what the "Big Bang" was. Was it really something from nothing springing forth from a point of singularity the size of a proton? I sure as heck do not believe that! The CMB would be evidence IF it were isotropic and uniform to a degree that the image I posted is not. And surely you see that to prop up the Big Bang, you are introducing another gnome because the author of the article isn't assuming an overly simplistic model ... he's using the model that the mainstream developed. To save the Big Bang idea you are now positing some "unknown" complexity. Sorry .... but that isn't how science is supposed to work. The reason I went through what I said above is because assuming there was a Big Bang, there is nothing presently within quantum physics nor within our observable Universe as it is today which can explain what happened. Why is this important? Because I do not believe the Cosmological Principal applies to what happened in the Big Bang. See what I mean? That's another gnome. And you virtually stand alone outside the mainstream thinking that the Cosmological Principal doesn't apply to it. I think (but cannot prove) that the Big Bang involved something or some things outside of our known Universe; outside of our physical laws and thus outside of this Universe's quantum physics. Gnomes. Gnomes. Gnomes. None of this is science ... it's metaphysics. Why not instead go back and listen to the evidence for a steady state, electric current, plasma filled universe ruled by the physics of the standard model? REAL PHYSICS. NOT METAPHYSICS. To save the Big Bang idea you are now positing some "unknown" complexity. You give me way too much credit for coming up with this. No, this has been discussed by others long before I mentioned it. Ok, so what, I'm putting it out there for discussion, that's all. None of that better explains the origin of the Universe than does the Big Bang. You can poke holes in all of these "theories" if you want to. None of us were there billions of years ago. None of us can directly observe a Universe being created, or coming into being. We have a few things that we can observe from our tiny planet from which we can draw some inferences. That's all. I'm interested in the origin of the Universe. I'm also interested in discussing, and hearing others discuss possible ways in which it came about. Unlike you, I do not maintain that I know it's origin or that it is possible for us to ever know or prove its origins. Nor am I here to "prove" to you which theory is right, or even which is best. Is your only point that the Steady State Theory is the correct theory to describe the nature of the Universe? That all else is FauxPhysics? If you have a particular theory that you like above all others, then just state it and explain why you like it over other theories. My point is that if this is a steady state universe ... as some plasma cosmologists have suggested ... if the Big Bang is a gnome and the universe is IMMENSELY old ... if Arp was right about what quasars are ... then understanding the cause of the universe is a lot less important than if there was a Big Bang (cyclic or not). In that case, as you say, the origin of the universe might be so far in the past that there simply are no clues regarding what happened to *create it*. In which case it doesn't matter. Or, possibly, creation is occurring all the time (ala Arp) in which case the mainstream is looking in the wrong place for that creation (which I would grant is important to understand). So the discussion of whether we live in a gravity dominant Big Bang universe or a plasma/electricity controlled steady state universe should be answered FIRST. Otherwise you might as well be discussing god. Unlike you, I do not maintain that I know it's origin or that it is possible for us to ever know or prove its origins. I've never said or even implied that. In fact, I tend to believe just the opposite, as the last paragraph I wrote shows. I just want us to start this discussion from a position of properly understanding the universe we now see. I want us to practice SCIENCE ... PHYSICS ... not METAPHYSICS or RELIGION. I suggest Big Bang Cosmology has become a CULT ... not science. And resolving THAT is a far more important topic that the origin at this point because the resolution of that issue would affect any discussion of origin. I never suggested we negate what is observed. Just the opposite. I want to point out that you actually do suggest negating what is observed. When you say " the rest of the evidence is all circumstantial phenomena﻿ that they observe and attribute to black holes", you are in fact negating observed phenomena and mathematical models relating to that observed phenomena. Seeing a black hole with your own eyes is not nearly the only evidence of black holes. The absence of light; the interactions between the gravitational forces of the black hole on surrounding matter and energy - these are good evidence of black holes. Circumstantial evidence is often far better evidence than visual evidence. DNA evidence (circumstantial) has been proven to be far more effective at identifying someone than human observational evidence. So, when I see someone discount mathematical models and evidence based on a claim that it is "merely circumstantial evidence", I have to discount what that person is arguing against. It's a logically faulty road to go down to discredit circumstantial evidence and require only direct observational evidence to prove something. When we see microwaves coming from all parts of the visible universe, they might just be coming from all parts of our solar system, or all parts of our galaxy. The very fact that the Axis of Evil is aligned with our orbit around the sun argues that it is related to our solar system, not the universe as a whole. Of course, if the CMB is not really cosmic, then it has no value as evidence for the Big Bang. Even if the CMB is cosmic, it clearly argues against the cosmological principle. Regarding Cosmic Microwave Background radiation, you make a faulty inference which I must point out. The CMB has a very specific and identifiable spectrum and temperature of 2.72548±0.00057K which does not come from all parts of our solar system or our Sun, or all parts of only our galaxy. So, the CMG is evidence of a big bang, but I acknowledge that it is just evidence and not absolute proof. I suggest Big Bang Cosmology has become a CULT ... not science. And resolving THAT is a far more important topic that the origin at this point because the resolution of that issue would affect any discussion of origin. I don't see it quite as a "Cult" in the way I see Global Warming as a real Cult. Intellectually, I too am skeptical of some of the claims made as to the Big Bang theory, but I don't discount it altogether. Particularly, I do not believe that this Universe originated from a tiny singularity that popped into existence as quantum particles seem to be observed going in and out of existence. I have nothing to support my claim, however, other than it seems to violate the known physical laws of this Universe. Regarding Black Holes. Physicists have debated back and forth whether true "black holes" exist. The debate is more about whether anything can ever escape a black hole, and if it can, it would therefore not be a true black hole. But, none of them dispute that at the center of our galaxy (and likely all galaxies) there is a supermassive object from which no light or radiation is emitted, thus looking "black". The debate is about the nuances of black holes and whether they are as absolute as postulated. You can read the history of Stephen Hawkins' skepticism and then final acceptance of black holes to see what I mean. I want to point out that you actually do suggest negating what is observed. When you say " the rest of the evidence is all circumstantial phenomena﻿ that they observe and attribute to black holes", you are in fact negating observed phenomena and mathematical models relating to that observed phenomena. I'm not negating any observations, Skans. But I am arguing against the explanation the mainstream has come up with for the observations ... against the gnome filled models they now employ in EVERY case. For example, they claim the jets ... energized plasma filaments ... that they see coming from the center of galaxy after galaxy MUST be due to black holes ... which originally were not supposed to let any matter or light escape. And to make that claim SEEM reasonable, they've introduced a host unproven (and downright bogus) gnomes. They believe in magnetic reconnection and in frozen-in magnetic fields. They treat magnetic field *lines* like there are real things. And list goes on. The top scientists in the field of plasma physics and electromagnetism (people who got Nobel Prizes for developing the field ... people whose names are all over the physics) told them over and over that these things were nonsense. But they just ignored those experts and plowed ahead, creating new gnomes every time a new observation didn't make sense with the previous zoo of gnomes. And all the while they ignored electric current and plasma phenomena that results from the flow of electric current through it ... phenomena that could be observed in labs here on earth and that the plasma community argued could explain those same observations they were ascribing to black holes (other things like dark matter, dark energy, etc). The mainstream community REFUSED to debate the matter as REAL scientists would do. They just ignored alternative theories and went on preaching their gospel. They even went so far as to keep the alternative scientists from publishing papers in their journals. It got so bad that the scientific community split ... with mainstream gnome believers publishing in one of set of journals (the journals that were censoring the other side's papers) and the EU/PC community publishing in a different set of journals. And in the two groups going to separate conferences. Unfortunately, the gnome believers got control of the media and government funding ... because they were better preachers ... and lets face it, the gnomes sounded *coooool*. I have to laugh if for no other reason than the precision of that temperature you cite. I'm not so sure you can claim it's an identifiable spectrum or that it does not come from something to do with our solar system or our galaxy. After all, how do you explain the axis of evil in the CMB map I posted? The fact that the axis is aligned with the plane of our solar system is an observation so don't just negate it ... explain it. Try to convince me that its perfectly reasonable that the plane of our solar system should be aligned with the plane of emissions from the supposed beginnings of the universe? When so many other solar systems clearly do not align with that plane. Hey .. maybe it's evidence of God at work? Eh? Furthermore, the *history* that the mainstream created around the CMB is a distortion of the facts. They claim the CMB confirmed they hypothesis of the Big Bang, but there was NO prediction that the CMB temperature would be 2.73K. So to say it "confirmed" the Big Bang theory is false. The fact is that in 1964 Wilson and Penzia detected some unexplained noise that they then ascribed it to a cosmic microwave background. They calculated a temperature of 3.5K from the data, which the COBE satellite later revised to 2.73 K. But as far as predictions are concerned, George Gamow, who is credited with predicting the CMB temperature, estimated it would be 5K in 1948, but in the 1950s he raised that estimate to 10K, and then by 1961 had raised it to 50K! Another prediction was made by Robert Dicke who predicted in 1946 that it would be 20 K. He later revised to 45 K! So the truth is that the 2.73K was no where near what the mainstream Big Bang theorists had said it would be. You could argue the measured temperature was a negative result on the Big Bang hypothesis. Now, post facto, Big Bang critics (and steady state proponents), Fred Hoyle, Geoffrey Burbidge and Jayant Narlikar argued that the measured temperature could be explained more naturally ... that it was just the consequence of the conversion of hydrogen into helium by fusion reactions inside stars. The result of their calculations of the total amount of energy produced by the fusion of hydrogen to produce all the helium observed in the universe was 2.68K. Now that energy would be in the form of visible or ultraviolet radiation, not microwave radiation, but they believed there were several processes that could degrade the former to the latter radiation. The one considered by Hoyle was the diffusion of light through cosmic dust, where a fraction of the dust was made of wiskers, fine carbon and iron needles. This type of dust might be released by the explosion of massive stars and some laboratory experiments showed that the dust could condense into needles that would efficiently turn light into microwave radiation. The main problems was producing a pure Planckian spectrum as observed. But in a steady state universe (or one with a much longer cycle than the mainstream's 13 Billion years ... a "quasi-stationary universe") , this difficulty would go away, and using this model, in 2007 Narlikar and Burbidge (Hoyle was now deceased) were able to reproduce the results from WMAP, not only in temperature but in terms of the size of fluctuations. Now, here's the really interesting thing. PREDICTIONS by other theorists, who did not base their estimates on the Big Bang, were much closer than Gamow or Dicke. Based on the study of narrow absorption line features in the spectra of stars, astronomer Andrew McKellar wrote in 1941 that "it can be calculated that the ‘rotational temperature’ of interstellar space is 2 K." But his paper was just ignored. Then in 1954, Finlay-Freundlich, a German astronomer, predicted 1.9K to 6K on the basis of "tired light" assumptions, and mind you, the model that the EU/PC community believes is correct is a tired light one. Even before those predictions, various scientists were making estimates of the temperature of space. Charles Guillaume calculated in 1896 that the effect of the radiation of all the stars on a given point in space would be 5.6K. Astrophysicist Arthur Eddington improved on the same calculation later in 1926 and came up with 3.2 K. German physicist Erich Regener calculated in 1933 that the temperature rise due to cosmic rays would be 2.8 K. As you can see, it was rather easy to produce a temperature that was within a few degrees of the *later* observed one. And you can see that if successful prediction is proof of something in science, it is the NON--Big Bang community that got it right, not the Big Bang community. So maybe you should take another look at that before jumping on the Big Bang band wagon? But, none of them dispute that at the center of our galaxy (and likely all galaxies) there is a supermassive object from which no light or radiation is emitted, thus looking "black". I have no doubt there is something massive near the core of the galaxy. But does it necessarily have to be a black hole? According to Plasma Cosmologists (starting with Hannes Alfven, Peratt and Lerner), our galaxy is a homopolar motor and there is a galactic sized plasmoid … a powerful z-pinch … acting at the core of the galaxy. This z-pinch is formed as massive filamentary helical “Birkeland” currents flow into the core. As Eric Lerner describes it, the pinch is "the rotational energy of an entire galaxy, augmented by the gravitational energy released as the galaxy contracts," "converted to electrical power by the disk-generator action and concentrated in the smaller filaments moving towards the galaxy core." This pinch, as shown by computer modeling, can account for the vast energies and phenomena produced by our galaxy’s core … the gamma rays, x-rays, jets, etc. … things that the black hole theorists still have trouble explaining adequately or at all (without resorting to still more magical gnomes). Gravity from a galaxy sized plasmoid, combined with the rotation of the plasma about this plasmoid due to the magnetic fields that would result from it, might be enough to cause the stellar motions from which a black hole of 4 million sun has been deduced by the mainstream. But mainstream astrophysicists have simply ignored this possibility. And it’s their own fault that no one has obtained the funding needed to check this out since black hole evangelists control the funding and simply will not fund anything that challenges their pet gnomes. Believe me Skans, I've considered this issue at length. I am just not convinced by the mainstream's gnomes. The debate is about the nuances of black holes and whether they are as absolute as postulated. Maybe in the mainstream community, but not in the EU/PC community. Translation. NO DARK MATTER FOUND. If theorists’ current best guess for what dark matter is made of is wrong, DEAP won’t find anything either. Then again, if the theorists are right, the world’s best shot at discovering dark matter may be sitting in an ore mine in Sudbury. And you can imagine that with that list of names as authors, they wasted a lot of money to learn that. In fact, the above article states that they spent $20 million dollars constructing DEAP (through December 2015)! But don’t worry … DEAP 50T is in the works … with about 12 TIMES the amount of expensive, liquid argon … and maybe 3 times the cost! It will keep all those *scientists* employed. Oh my … more bad Dark Matter news out of Canada. Final results are reported from operation of the PICO-60 C3F8 dark matter detector, a bubble chamber filled with 52 kg of C3F8 located in the SNOLAB underground laboratory. … snip … A new blind 1404-kg-day exposure at 2.45 keV threshold was acquired with approximately the same expected total background rate as the previous 1167-kg-day exposure at 3.3 keV. Translation … more money wasted. No Dark Matter detected. But don’t worry, there’s a follow on experiment being discussed for this one too. Translation … even more money wasted. No Dark Matter detected. And why bother to find out if a follow on experiment is planned. Of course one is. After all, they’ve got to keep all those *scientists* (29 nine not shown!) employed. Because God Forbid one blows the whistle on this scam. According to many, it would be better to have called it invisible matter, rather than dark matter. 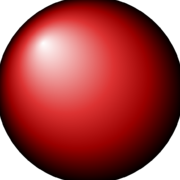 It not only doesn't emit or absorb light, but it doesn't interact with any of the known, directly detectable particles through the electromagnetic, strong, or weak nuclear forces. The most sought after dark matter candidate is the WIMP: the Weakly Interacting Massive Particle. The big hope was for a WIMP miracle, a great prediction of supersymmetry. It's 2019, and that hope is now dashed. Direct detection experiments have thoroughly ruled out the WIMPs we were hoping for. If you want to directly detect dark matter, it isn't as simple as detecting the known particles of the Standard Model. For anything made out of quarks, leptons, or the known bosons, we can quantify what forces they interact through and with what magnitude. We can use what we know about physics, and in particular about the known forces and interactions between the known particles, to predict quantities like cross-sections, decay rates and products, scattering amplitudes, and other properties we're capable of measuring in experimental particle physics. As of 2019, we've met with tremendous success on those fronts that have confirmed the Standard Model in ways that both theorists and experimentalists could have only dreamed of half a century ago. Detectors at colliders and isolated, underground facilities have led the way forward. 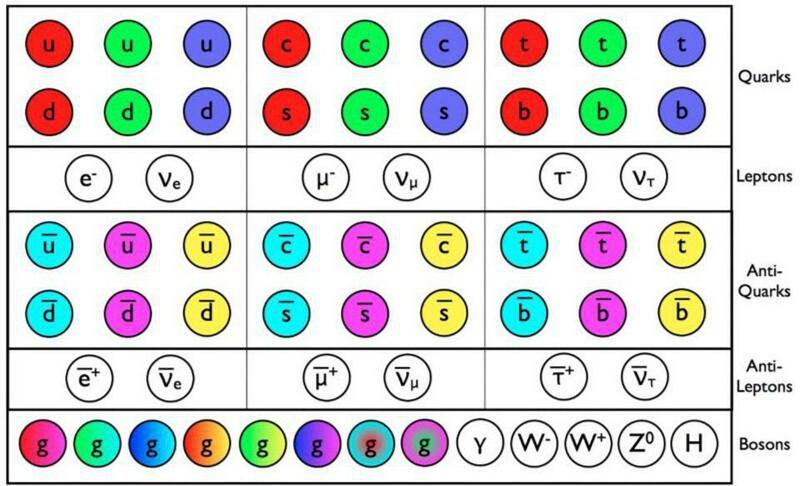 There are a whole spectrum of particles — both fundamental and composite — predicted by the Standard Model. Their interactions through the strong nuclear, electromagnetic, and weak nuclear forces can be calculated through techniques developed in quantum field theory, allowing us to create and detect those particles in a variety of ways. Every single quark and antiquark has now been directly produced in an accelerator, with the top quark, the last holdout, falling in 1995. Every lepton and antilepton has been seen by detectors, with the tau neutrino (and its antimatter counterpart, the tau antineutrino) completing the lepton sector in the early-to-mid 2000s. And every one of the Standard Model bosons has been created and detected as well, with the Higgs boson, the final piece of the puzzle, definitively appearing at the LHC in 2012. We understand how the Standard Model particles behave. We have solid predictions for how they should interact through all of the fundamental forces, and experimental confirmation of those theories. We also have extraordinary constraints on how they're permitted to interact in a beyond-the-Standard-Model fashion. Because of our constraints from accelerators, cosmic rays, decay experiments, nuclear reactors and more, we've been able to rule out many possible ideas that have been theorized. When it comes to what might make up the dark matter, however, all we have are the astrophysical observations and our theoretical work, in tandem, to guide us. The possible theories that we've come up with include a huge number of dark matter candidates, but none that have garnered any experimental support. The most sought-after dark matter candidate is the WIMP: the Weakly Interacting Massive Particle. In the early days — i.e., back in the 1970s — it was realized that some particle physics theories that predicted new particles beyond the Standard Model could eventually produce new types of stable, neutral particles if there were some new type of parity (a type of symmetry) that prevented them from decaying. The WIMP miracle is over. But we still might get the best miracle of all: if these experiments turn up something beyond a null result. The only way to know is to look. You understand what that says, folks? The Standard Model ... the one that EU/PC proponents believe in ... works GREAT! It's a mighty success. But the model that Dark Matter believers MUST believe in is a complete bust. So not only is the WIMP candidate for dark matter dead, but so are all the grandiose and gnome laden theories of the particle physicists who signed a deal with the devil (the dark matter believing astrophysicists) way back when to get funding for their gnomes. Unfortunately, now, rather than accept the obvious and rethink their gnomes ... look outside the box they put themselves in ... they go on believing. And spending YOUR money. And driving Big Science even farther off the cliff. It's sad. No ... actually it's a tragedy for mankind due to the wasted resources and all the lost opportunities to really understand the universe around us. It's the same disease they have in the AGW/Climate science community. And whether it's related to leftism ... well ... I wonder. A few days has gone by … time for a new DM gnome. Dark matter may scatter against each other only when they hit the right energy, say researchers in Japan, Germany, and Austria in a new study. Their idea helps explain why galaxies from the smallest to the biggest have the shapes they do. "Dark matter is actually our mom who gave birth to all of us. But we haven't met her; somehow, we got separated at birth. Who is she? That is the question we want to know," says paper author Hitoshi Murayama, a University of California Berkeley Professor and Kavli Institute for the Physics and Mathematics of the Universe Principal Investigator. Astronomers have already found dark matter does not seem to clump together as much as computer simulations suggest. If gravity is the only force that drives dark matter, only pulling and never pushing, then dark matter should become very dense towards the center of galaxies. However, especially in small faint galaxies called dwarf spheroidals, dark matter does not seem to become as dense as expected toward their centers. This puzzle could be solved if dark matter scatters with each other like billiard balls, allowing them to spread out more evenly after a collision. But one problem with this idea is that dark matter does seem to clump in bigger systems such as clusters of galaxies. What makes dark matter behave differently between dwarf spheroidals and clusters of galaxies? An international team of researchers has developed an explanation that could solve this riddle, and reveal what dark matter is. "If dark matter scatters with each other only at a low but very special speed, it can happen often in dwarf spheroidals where it is moving slowly, but it is rare in clusters of galaxies where it is moving fast. It needs to hit a resonance" says Chinese physicist Xiaoyong Chu, a postdoctoral researcher at the Austrian Academy of Sciences. Resonance is a phenomenon that appears every day. To swirl wine in a glass to get it more oxygen so that it lets out more aroma and softens its taste, you need to find the right speed to circle the wine glass. Or you dial old analog radios to the right frequency to tune into your favorite station. These are all examples of resonance, says Murayama. The team suspects this is precisely what dark matter is doing. "As far as we know, this is the simplest explanation to the puzzle. We are excited because we may know what dark matter is sometime soon," says Murayama. However, the team was not convinced that such a simple idea would explain the data correctly. "First, we were a bit skeptical that this idea will explain the observational data; but once we tried it, it worked like a charm!" says Colombian researcher Camilo Garcia Cely, a postdoctoral researcher at the Deutsches Elektronen-Synchrotron (DESY) in Germany. The team believes it is no accident that dark matter can hit the exact right note. "There are many other systems in nature that show similar accidents: in stars alpha particles hit a resonance of beryllium, which in turn hits a resonance of carbon, producing the building blocks that gave rise to life on Earth. A similar process happens for a subatomic particle called phi," says Garcia Cely. "It may also be a sign that our world has more dimensions than we see. If a particle moves in extra dimensions, it has energy. For us who don't see the extra dimension, we think the energy is actually a mass, thanks to Einstein's E=mc2. Perhaps some particle moves twice as fast in extra dimension, making its mass precisely twice as much as the mass of dark matter," says Chu. The team's next step will be to find observational data that backs their theory. "If this is true, future and more detailed observation of different galaxies will reveal that scattering of dark matter indeed depends on its speed," says Murayama, who is also leading a separate international group that intends to do precisely this using the under construction Prime Focus Spectrograph. The US$80 million instrument will be mounted on the Subaru telescope atop Mauna Kea on Big Island, Hawaii, and will be capable of measuring the speeds of thousands of stars in dwarf spheroidals. Anyone want to bet that they find what they’re going to be looking for ... once their "$80 million dollar instrument" is built? And when they don't find what they're looking for ... anyone want to bet they don't seek to build an even more expensive *instrument*? That is ... after all ... the way these gnomes have gone before. And just how wacky is modern astrophysics? “The discovery of dark energy has greatly changed how we think about the laws of nature,” said Edward Witten, creator of string theory and one of the world’s leading theoretical physicist at the Institute for Advanced Study in Princeton, N.J. who has been compared to Newton and Einstein. One of the great known unknowns of the universe is the nature of dark energy, a force field making the universe expand faster. Current theories range from end-of-the universe scenarios to dark energy as the manifestation of advanced alien life. A new, controversial theory suggests that this dark energy might be getting stronger and denser, leading to a future in which atoms are torn asunder and time ends. Then, after another 100,000 years or so, the new field simply switched off, leaving no trace other than a speeded-up universe says a team of astronomers from Johns Hopkins University led by Adam Riess, a Bloomberg Distinguished Professor and Nobel laureate who is an expert in the Hubble constant. In a bold and speculative leap into the past, the team has posited the existence of this field to explain a baffling astronomical puzzle: the universe seems to be expanding faster than it should be. The paper explains that if the new exotic matter takes the form of a cosmological constant (like that required to explain the accelerated cosmic expansion in the universe today), agreement can be achieved between Cosmic Microwave Background (CMB) measurements and theoretical expectations in the standard model using supernovae. In fact, the data seem to fit together slightly better with the early dark energy theory. As the paper shows, more precise measurements of the CMB in the future should further test the newly proposed scenario. The early dark energy resembles that seen in the universe today, although with a density nearly 10 billion times as large. It also resembles the dark energy in the very earliest universe that has been postulated to set the expansion in motion. Combined, these observations suggest that the universe may undergo episodic periods where dark energy becomes important, and if so, the dark energy in the current universe may be just be the latest incarnation. One idea for the mechanism of an accelerating cosmic expansion is called quintessence, a relative of the Higgs field that permeates the cosmos. Perhaps some clever life 5 billion years ago figured out how to activate that field, speculates astrophysicist Caleb Scharf in Nautil.us. How? “Beats me,” he says, “but it’s a thought-provoking idea, and it echoes some of the thinking of cosmologist Freeman Dyson’s famous 1979 paper Time Without End,” where he looked at life’s ability in the far, far future to act on an astrophysical scale in an open universe that need not evolve into a state of permanent quiescence. Where life and communication can continue for ever. Seriously folks … is this what *science* has become? The magnetic field lines of the the Cigar Galaxy (also called M82) appear in this composite image. The lines follow the bipolar outflows (red) generated by exceptionally high rates of star formation. Credit: NASA/SOFIA/E. Lopez-Rodiguez; NASA/Spitzer/J. Moustakas et al.. The Cigar Galaxy (also known as M82) is famous for its extraordinary speed in making new stars, with stars being born 10 times faster than in the Milky Way. Now, data from the Stratospheric Observatory for Infrared Astronomy, or SOFIA, have been used to study this galaxy in greater detail, revealing how material that affects the evolution of galaxies may get into intergalactic space. 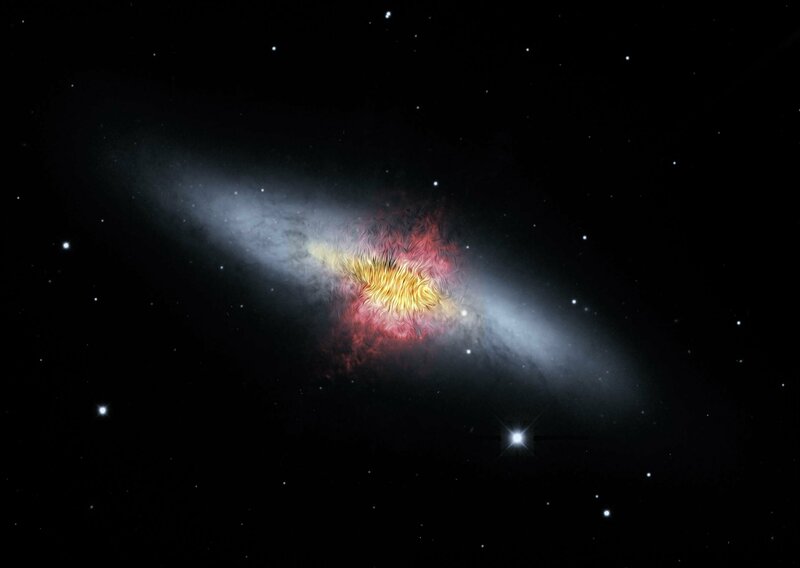 Researchers found, for the first time, that the galactic wind flowing from the center of the Cigar Galaxy (M82) is aligned along a magnetic field and transports a very large mass of gas and dust—the equivalent mass of 50 million to 60 million Suns. "The space between galaxies is not empty," said Enrique Lopez-Rodriguez, a Universities Space Research Association (USRA) scientist working on the SOFIA team. "It contains gas and dust—which are the seed materials for stars and galaxies. Now, we have a better understanding of how this matter escaped from inside galaxies over time." Besides being a classic example of a starburst galaxy, because it is forming an extraordinary number of new stars compared with most other galaxies, M82 also has strong winds blowing gas and dust into intergalactic space. Astronomers have long theorized that these winds would also drag the galaxy's magnetic field in the same direction, but despite numerous studies, there has been no observational proof of the concept. Researchers using the airborne observatory SOFIA found definitively that the wind from the Cigar Galaxy not only transports a huge amount of gas and dust into the intergalactic medium, but also drags the magnetic field so it is perpendicular to the galactic disc. In fact, the wind drags the magnetic field more than 2,000 light-years across—close to the width of the wind itself. "One of the main objectives of this research was to evaluate how efficiently the galactic wind can drag along the magnetic field," said Lopez-Rodriguez. "We did not expect to find the magnetic field to be aligned with the wind over such a large area." First, notice that once again they just can’t bring themselves to use the right name for the material that they are viewing … PLASMA … not “gas and dust”. It’s an important distinction which is part of the reason they remain so clueless. Second, what they observed was PREDICTED decades and decades ago by plasma cosmologists. It’s evidence of either the galactic homopolar motor proposed by Alfven or the related plasma focus proposed by Lerner. What if It's Not Dark Matter Making The Universe's Extra 'Gravity', But Light? My purpose isn't to highlight yet another gnome to explain why Dark Matter isn't working. "However, we need to keep an open mind as long as we do not actually know what dark matter is." LOL! The mainstream has anything BUT an open mind. They have an ANYTHING but plasma/electricity mind. Oh oh … more problems for the Dark Matter gnome. Dark matter is a mysterious, invisible substance that typically dominates the makeup of galaxies; finding an object that's missing dark matter is unprecedented, and came as a complete surprise. "If there's one object, you always have a little voice in the back of your mind saying, 'but what if you're wrong?' Even though we did all the checks we could think of, we were worried that nature had thrown us for a loop and had conspired to make something look really special whereas it was really something more mundane," said team leader Pieter van Dokkum, Sol Goldman Family Professor of Astronomy at Yale University. Now, van Dokkum's team has not one, but two, new studies supporting their initial observations, demonstrating that dark matter is in fact separable from galaxies. Team members include Roberto Abraham, Professor of Astronomy and Astrophysics at the University of Toronto, Aaron Romanowsky, Associate Professor of Physics and Astronomy at San Jose State University, Charlie Conroy, Professor of Astronomy at Harvard University, and Shany Danieli, a graduate student at Yale University. "The fact that we're seeing something that's just completely new is what's so fascinating," said Danieli, who first spotted the galaxy about two years ago. "No one knew that such galaxies existed, and the best thing in the world for an astronomy student is to discover an object, whether it's a planet, a star, or a galaxy, that no one knew about or even thought about." In the first study, the team confirmed their initial observations of NGC 1052-DF2, or DF2 for short, which show dark matter is practically absent in the galaxy. Using W. M. Keck Observatory's Keck Cosmic Web Imager (KCWI), they gathered more precise measurements and found that the globular clusters inside the galaxy are indeed moving at a speed consistent with the mass of the galaxy's normal matter. If there were dark matter in DF2, the clusters would be moving much faster. "KCWI is unique because of the combination of its large survey area," said lead author Danieli. "The instrument not only allows us to see the whole galaxy at once, its high spectral resolution also enables us to measure the mass accurately. There is no other instrument in the world that has those two properties!" In the second study, the team used Keck Observatory's Low Resolution Imaging Spectrometer (LRIS) to find another galaxy devoid of dark matter, named NGC 1052-DF4, or DF4 for short. "Discovering a second galaxy with very little to no dark matter is just as exciting as the initial discovery of DF2," said van Dokkum, who is the lead author on the DF4 paper. "This means the chances of finding more of these galaxies are now higher than we previously thought. Since we have no good ideas for how these galaxies were formed, I hope these discoveries will encourage more scientists to work on this puzzle." Ironically, the lack of dark matter in these UDGs strengthens the dark matter theory. It proves that dark matter is a substance that is not coupled to 'normal' matter, as both can be found separately. The discovery of these galaxies is difficult to explain in theories that change the laws of gravity on large scales as an alternative to the dark matter hypothesis. Not a one of them can think outside the gnome-filled box they’ve built around themselves. NOT A ONE. Physicists from MIT and elsewhere have performed the first run of a new experiment to detect axions—hypothetical particles that are predicted to be among the lightest particles in the universe. If they exist, axions would be virtually invisible, yet inescapable; they could make up nearly 85 percent of the mass of the universe, in the form of dark matter. Yes, hope always springs eternal with these cultists. Anything to keep the funding going. After all, their children probably need braces. "We are talking about dark matter particles that are 28 orders of magnitude lighter than the electron. This notion is critically important for the model that we decided to test. The gravitational interaction is what betrays the presence of dark matter. If we explain all the observed dark matter mass in terms of ultralight particles, that would mean there is a tremendous number of them. But with particles as light as these, the question arises: How do we protect them from acquiring effective mass due to quantum corrections? Calculations show that one possible answer would be that these particles interact weakly with photons—that is, with electromagnetic radiation. This offers a much easier way to study them: by observing electromagnetic radiation in space," said Sergey Troitsky, a co-author of the paper and chief researcher at the Institute for Nuclear Research of the Russian Academy of Sciences. When the number of particles is very high, instead of individual particles, you can treat them as a field of certain density permeating the universe. This field coherently oscillates over domains that are on the order of 100 parsecs in size, or about 325 light years. What determines the oscillation period is the mass of the particles. If the model considered by the authors is correct, this period should be about one year. When polarized radiation passes through such a field, the plane of radiation polarization oscillates with the same period. If periodic changes like this do in fact occur, astronomical observations can reveal them. And the length of the period—one terrestrial year—is very convenient, because many astronomical objects are observed over several years, which is enough for the changes in polarization to manifest themselves. The authors of the paper decided to use the data from Earth-based radio telescopes, because they return to the same astronomical objects many times during a cycle of observations. Such telescopes can observe remote active galactic nuclei—regions of superheated plasma close to the centers of galaxies. These regions emit highly polarized radiation. By observing them, one can track the change in polarization angle over several years. Oh ... and on the black hole front? 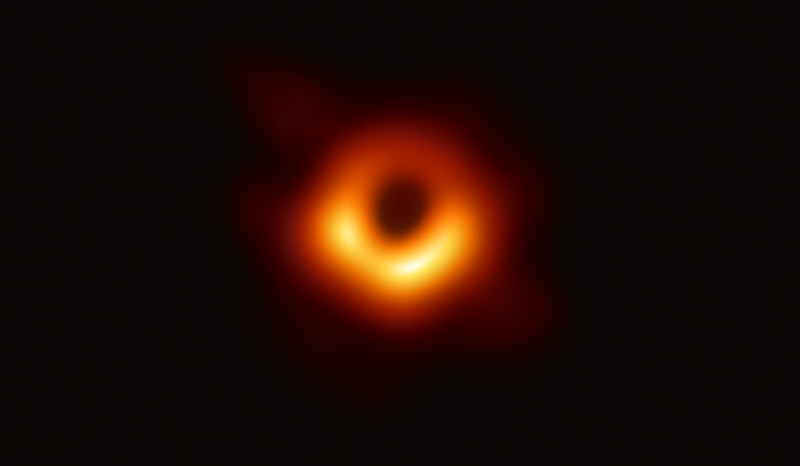 Still waiting for that picture of a black hole that was promised us ... LAST YEAR. Remember in President Eisenhower’s Farwell Address he warned about the Military Industrial Complex? Well he warned about something else, too. And this is exactly what we’ve seen happen with both AGWalarmism and modern astrophysics. Public policy has become the captive of scientific priesthoods. Oh dear, it’s been theorized that primordial black holes might be the missing dark matter. Although the Hyper Suprime-Cam has a lot of pixels, Andromeda has even more stars. To detect individual lensing events, the team used software that compared consecutive images and highlighted any pixels that showed changes between them. After a night of observations, there were over 15,500 events that had to be sorted through. But these included things like variable stars, stellar flares, and eclipses in binary star systems. Focusing on short-term changes cut the number to about 12,000, while searching for symmetric "bumps" in which the light intensity goes up and drops down again left the researchers with a total of 66 possible microlensing events. Oh well ... another gnome ... busted. Another great post by Michael Mozina at Thunderbolts.info. There are at least three important and incredibly unique predictions of Scott's Birkeland current galaxy rotation model which have already been verified by observation. 1. Counter rotation. We've only been looking for counter rotating galaxies for the past couple of decades, it's challenging work, but already we've found numerous examples of counter rotation in virtually every type of galaxy. Neither DM or MOND predicts this. 2. Marklund convection. Merrifield has already verified that the outer disk of at least one galaxy contains more hydrogen than the inside disk. Scott discusses that issue in his video and explains why it's an important test of the BK model. 3. Galaxy collisions are not "random" or directed exclusively by gravity.Messier 82 (The Cigar Galaxy) Observable Birkeland currents direct the merger process. Stellar production is directed by current density, with the center of the current carrying the bulk of the mass. These are all very important, and already verified predictions of a Birkeland current galaxy rotation model which have already been verified by observation. Logically speaking, the existence of galaxies which require no dark matter can "probably" be used to eliminate MOND theory. If at least some galaxies follow an ordinary Newtonian rotation pattern, then modifying Newtons formulas probably isn't advisable or warranted. This leaves us with two remaining galaxy rotation models. One of them predicts all three of the above mentioned observations. It's fully consistent with the standard model of particle physics, and first principles that are derived directly from Maxwell's equations. The other galaxy rotation model is directly at odds with the standard particle physics model. It does not attempt to explain any of the three previously mentioned phenomenon in space which we have already observed. It's simworld computer models of satellite galaxies are directly at odds with the observation of satellite galaxies aligned along the disk. It not only failed it's own 'internal' predictive "test", it fails to predict at least three other known observations of galaxies. Which of these two remaining models then is the most "predicatively useful" in terms of describing the universe that we live in? From the perspective of science, and particularly empirical (in the lab) science, it's simply no contest. Even if we base the comparison on predictive value as it relates to galaxy observation, it's also no comparison at all. In terms of consistency with ordinary particle physics and plasma physics, it's also no contest. There's no criteria by which any other model is superior to the Birkeland current galaxy rotation model.